Monitor up to eight sensors (4 wireless, 4 hardwired) for temperature, humidity, water detection, and industrial measurements such as pressure or flow. 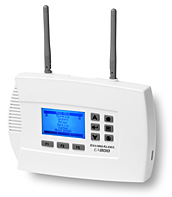 With a designated relay output for each sensor, the EnviroAlert EA800 will activate alarms, dialers or transmitters when programmed limits have been exceeded. Download via USB your complete datalog that includes event history, alarm history and sensor data.